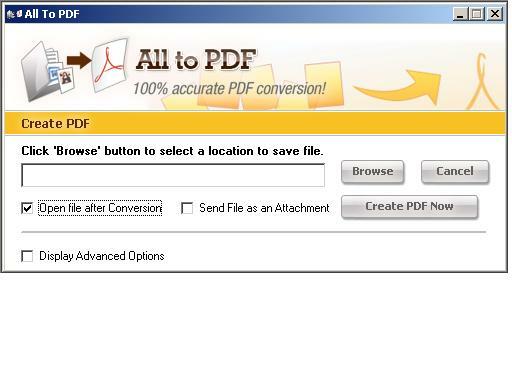 Quick All to PDF converts any printable document into PDF file retaining its original format. You can quickly convert Word, Excel, PowerPoint, HTML, Photoshop, CAD, CorelDraw, Illustrator files into PDF file format by using Quick All to PDF. Quick All to PDF retains the original document layout, formatting, fonts, images. You can add watermark, merge multiple pdf files and provide security by saving pdf files with encryption algorithms. Provide speedy conversions from PostScript and Encapsulated PostScript to PDF. PS to PDF can directly convert ps/eps to pdf formats. Qweas is providing links to Quick All to PDF 5.0 as a courtesy, and makes no representations regarding Quick All to PDF or any other applications or any information related thereto. Any questions, complaints or claims regarding this application Quick All to PDF 5.0 must be directed to the appropriate software vendor. You may click the publisher link of Quick All to PDF on the top of this page to get more details about the vendor.